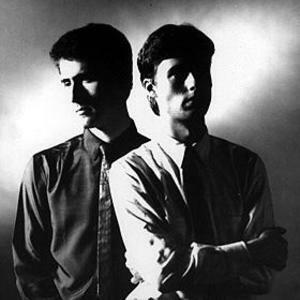 Orchestral Manoeuvres in the Dark (often abbreviated to OMD) is a synthpop group whose founding members are originally from the Wirral Peninsula, United Kingdom. OMD record for Virgin Records (originally for Virgin's DinDisc subsidiary). The group was founded in 1978 by Andy McCluskey and Paul Humphreys, after they had been involved in several bands, including The Id. Later drummer Malcolm Holmes and saxophonist Martin Cooper joined. The group was founded in 1978 by Andy McCluskey and Paul Humphreys, after they had been involved in several bands, including The Id. Later drummer Malcolm Holmes and saxophonist Martin Cooper joined. McCluskey and Humphreys formed the core of the outfit until 1989, when the group split in two. McCluskey retained the name and continued to record and tour as OMD with a new line-up until 1996, while Humphreys, Holmes, and Cooper formed "The Listening Pool". According to Songfacts, Enola Gay was the first of 7 Top 10 UK singles for the group; their only US hit was If You Leave, which was written for the 1985 movie Pretty In Pink. In late December 2005, OMD's official website announced a 2006 reformation, for both live performances and a new album, with rehearsals beginning in summer 2006. The line up features the original 1980's members (Andy McCluskey, Paul Humphreys, Malcolm Holmes and Martin Cooper). The "Architecture & Morality" tour for late 2006 was postponed until the beginning of 2007. The tour finally took place in the spring of 2007 featuring "Architecture & Morality" played in its entirety plus a 'greatest hits' set, although each concert famously ended with stirring rendition of B side/album track and fan favourite "The Romance Of The Telescope". Plans are now ahead for the release of a documentary DVD (since released and available here), a live DVD of the 2007 tour (release postponed until 2008) and a new studio album released in 2010, entitled "History of Modern".